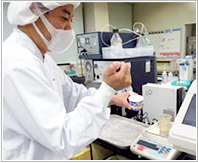 Customers | Yakult Honsha Co., Ltd.
Yakult sets internal product quality standards that are much more rigorous than standards set by relevant laws and regulations and establishes original systems that integrate ISO 9001-certified quality management systems with Hazard Analysis and Critical Control Point (HACCP) systems and food defense in connection with its efforts to provide products that are safe and of dependably high quality. 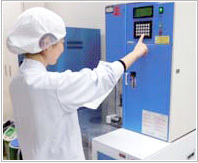 In Japan, we have developed and installed various kinds of inspection equipment that enable us to undertake continuous quality monitoring processes and inspect entire production batches. Our highly sophisticated quality management systems are ensuring the safety of all our products.Overseas, we conduct strict quality management suited to the laws and regulations and culture of each country based on our own internal standards.